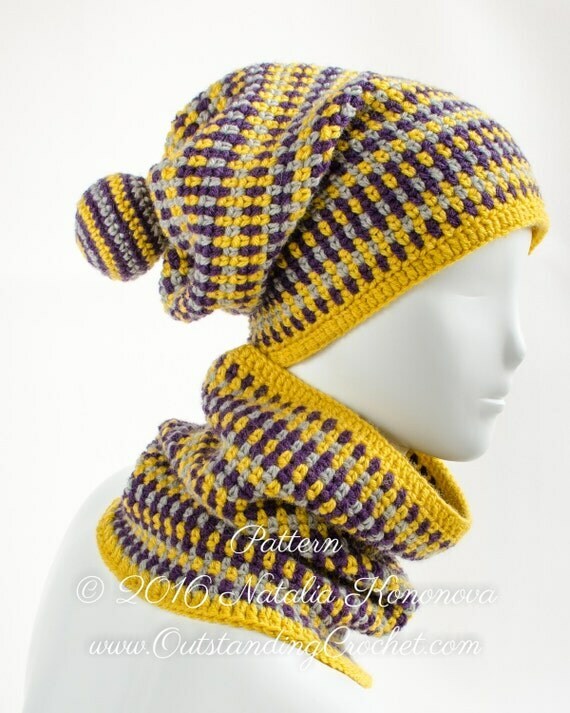 Outstanding Crochet: Crochet Pattern - Slouchy Beanie Toque Hat with Pom Pom and Cowl/Neck Warmer Set Crochet Pattern. New in my shops. Crochet Pattern - Slouchy Beanie Toque Hat with Pom Pom and Cowl/Neck Warmer Set Crochet Pattern. New in my shops. 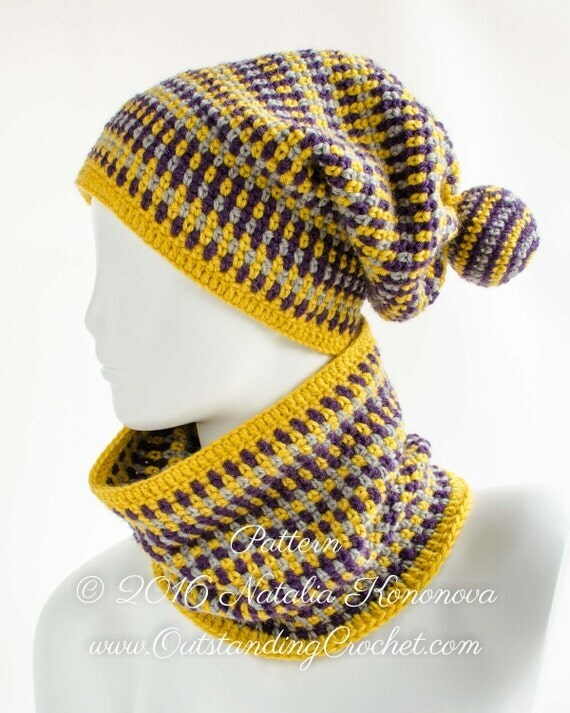 Slouchy Beanie hat with Pom Pom and Cowl Neck Warmer set Crochet Pattern by Natalia Kononova. Example of step picture inside the pattern. I know the hats season is almost over! :)) but take a look anyway. Toddler (Child, Teen-Adult Woman, Adult Man) / 18 (20, 21 ½, 23)'' / 46 (51, 54.5, 58.5) cm in head circumference. You'll find detailed step-by-step pictures with written instructions and a chart inside the PDF. 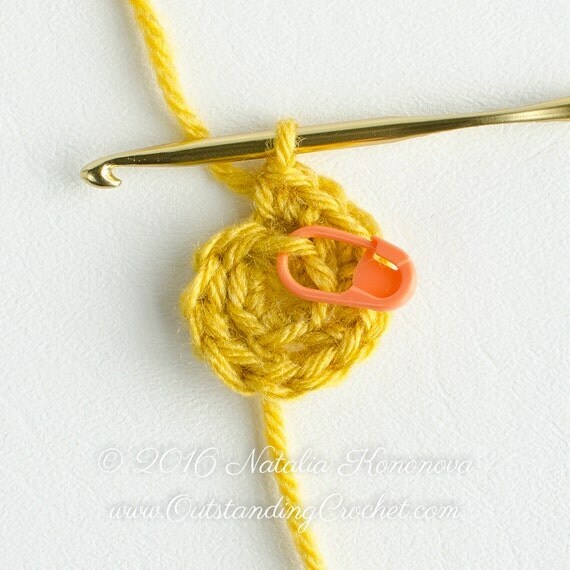 You can crochet a pom pom, striped or plain yellow, you choose, instructions are provided. ch (chain), sl st (slip stitch), sc (single crochet), blsc (back loop single crochet), dc (double crochet). - Worsted weight yarn in 3 colors, 1 skein each. Shown here: Lion Brand Vanna's Choice, 3.5 oz/100 g/170 yd/156 m, 100% acrylic. - Small amount of polyester fiberfill for a pom pom. - 2 locking stitch markers. - Toddler (Child, Teen-Adult Woman, Adult Man) / 18 (20, 21 ½, 23)'' / 46 (51, 54.5, 58.5) cm in head circumference. - Hat height 11 (11 ½, 12 ½, 12 ½)'' / 28 (29.5, 32, 32) cm. - Neck warmer circumference is the same as of the hat. - Neck warmer height: 9 ½ (10, 11, 11)'' / 24 (25.5, 28, 28) cm. - Linen Stitch: 18 sts x 18 rows = 4 x 4'' (10 x 10 cm). Piękny zestaw kolorów. Komplecik jest cudowny.Wzór ciekawy.Serdecznie pozdrawiam. Наташ, как всегда креативно. Красивое сочетание цветов.